OES-NA - What is included in the TMTG Package? What is included in the TMTG Package? 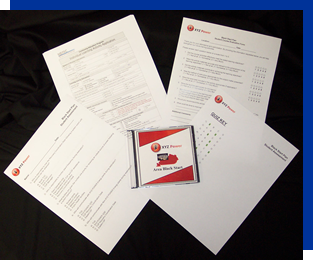 OES-NA's TMTG packages are customized with your company logo and company colors. With professional customization, the materials will fit nicely into your training resource library. 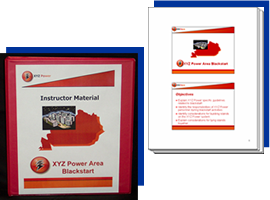 The Instructor Manual includes the presentation hard copy delivered in color in 2 slides per page format. This document can also be utilized as a master for creating additional Instructor Manuals for various Subject Matter Experts within your organization. 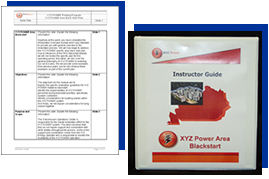 The second manual included is the Instructor Guide which provides instructor notes and talking points for every slide in the presentation. These guides provide great flexibility in allowing for various individuals to be utilized for training delivery, while still making possible the level of delivery consistency that is needed within world-class training organizations. 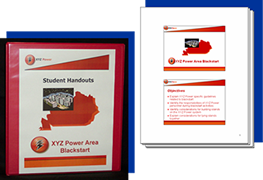 The Student Handout Manual includes the color master hard copy in 2 slides per page format for producing the handouts for the students. 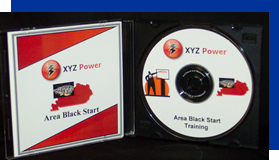 These handouts typically include the PowerPoint presentation slide handouts and any related exercise material. As part of the NERC CEP and as part of the Systematic Approach to Training development, assessment that the learning objectives have been satisfied is required. Our team of professionals at OES-NA develop this assessment for you as part of each TMTG package. These assessments can vary from multiple choice quizzes to instructor check-off lists recording each participant's completion of required exercises. Each assessment also includes the assessment key for the instructor's use. The second phase of assessment required by NERC and supported in the Systematic Approach to Training is the Activity Assessment or Evaluation. Use of this tool allows each participant's response to the training activity to be easily recorded. OES-NA has streamlined the NERC application process for you! Each TMTG package comes with a completed NERC ILA for that activity. All you have to do is to complete the application with your company and personal contact information and the application is ready for uploading to the NERC SOCCED. Submission of NERC CEH fees are not included, however.